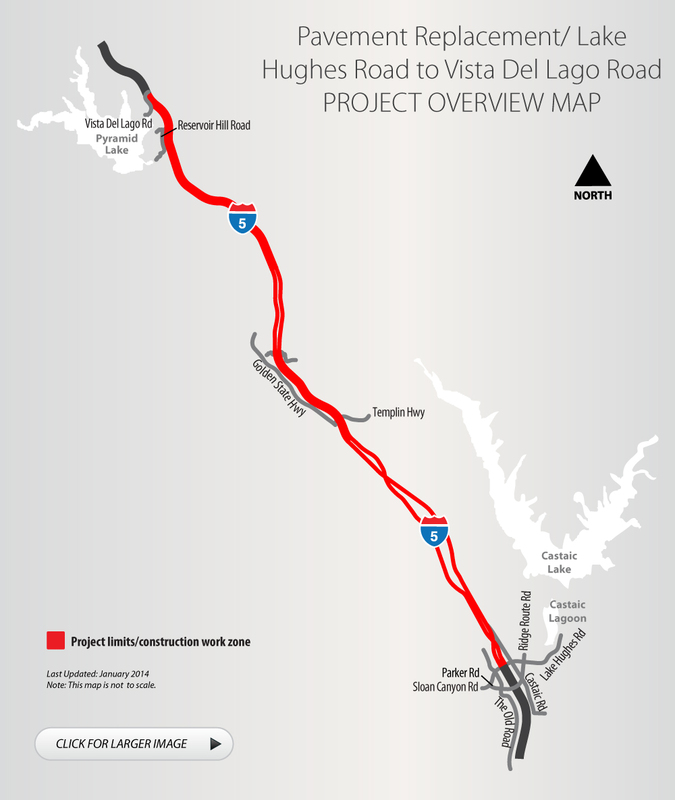 Caltrans place rubberized asphalt concrete along the Golden State Freeway (I-5) in both directions from Lake Hughes Road in Castaic and Vista Del Lago Road. This improvement will extend the life of the road, lessen the need for maintenance and related costs in addition to providing a smoother riding surface. The project investment of $23 million is partially funded by the American Recovery and Reinvestment Act (ARRA). Construction is expected to begin July 2011 and completed in mid-2012. Caltrans has put in to place a comprehensive public outreach program to keep the community informed about each stage of construction. Notices of community meetings and updated construction advisories will be posted on this website periodically. Thank you for your patience. For more information, please call toll-free (855) 454-6335.